The Community Photography Group is an independent voluntary organisation run in the manner of a freelance photography establishment. It is set up as an enabling organisation for unwaged people interested in learning and utilising interdisciplinary skills. The group is open to all with these shared interests and equipment or previous experience is not required. They are now the official photographers of N.C.N. allthough photographs from all other sources will also appear. You can find a couple of CPG photos on our new postcard page and a couple of examples are of CPG work are displayed below. 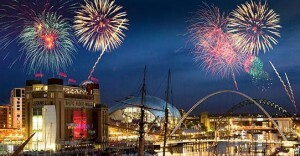 Newcastle Quayside New Years Eve 1998/99 rehearsing for the big 2000!